3/13/08 09:51 am :: Whats up?! Anthology Report and Etsy. 1/30/08 04:45 pm :: A post! someone requested I change my password for this account..
Just a photo collage of some of the stuff i've been doing of late - most of its up on my etsy site now - a few pieces though I have haven't uploaded yet. Although I've not posted as Zero-Gravity in ages .... somehow LJ thought I would like to do so today. No idea why. so most of my posts are going up as CLOCKWORK_ZERO... except this one. Probably a good thing as I would hate to see this old LJ vanish. Whats up?! Anthology Report and Etsy. Well, I've been sick for a bit... missed some work. blerg. But.. many many things are still going down. I got my contributors copy actually last week. it is a large paperback - about 400 pages. I was excited but it took me an age to read it - a day or more. I'm not sure why. It just didn't feel quite real. There were also some minor corrections I'd sent that didn't get corrected - annoying - but who cares?! Not me. I'm in PRINT! wheeee! Meanwhile, I'm still writing... short stories mostly. I feel I've broken through some kind of barrier. They are much much better than before. TheBigBad likes them. That in itself if a good thing. Even my supervisor liked the story in Desolate Places - and that was a surprise. it was shocking to say but something sold almost immediately. A very nice pair of Earrings. Still... I wasn't quite ready to have a sale so quickly so i was scrambling around trying to figure out what to do. them's the updates. I'm going to just sit here and cough and cough. well, looks like i'm going to be doing something new at work. Something different. I'm going to be moving out of the Tech Support job and more into a Service Manager position. Not sure quite what that means but it's a change. This does mean though the stress levels might start to come down. Sure I'll have a new job - but I won't have to deal with the admins who have been making my job a hell for 7 years. (esp the last 10 months or so). No pay change but i'll be happy to do something different. The writing is going along well. The anthology will be out soon - and they are looking into getting 3 of us together at a local bookstore for a signing. omg. ha. 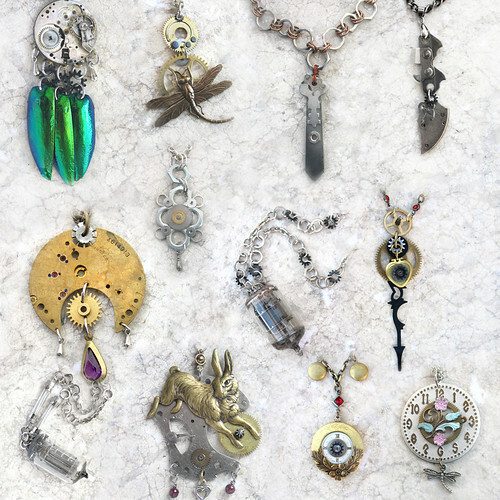 The steampunk jewelry is doing crazy-well. I'm just amazed. Cin and I were talking about it... how it is so much different than writing. With writing the idea is almost secondary to the work involved with the writing. It is a LOT of work. Then editing. Refining. Clarification. Rewriting. and then more work. With the steampunk jewelry its almost the opposite. The techniques I've learned over the last 2 decades (more!) of making jewelry are skills just waiting for the idea. Once the idea comes together it all just clicks into place - and then all i need to do is unpack those physical skills and create. Sometimes a piece will take a week of thinking and re-arrangement of pieces... but only a few hours to complete. meanwhile. more snow due? wtf? I know. Global warming has melted the frigging icecaps and they are all coming here to toronto to party. there's a 6-alarm fire in the downtown area of Toronto. For those in the know - its at Queen and Bathurst on the south side. Looks like that video store there is toast. burnt toast. On the way in the smoke covered the CN Tower - blotting it out. We can smell it all over the city. Anyway, I was worried about my friend who lives a few blocks away... but E is fine. whew. 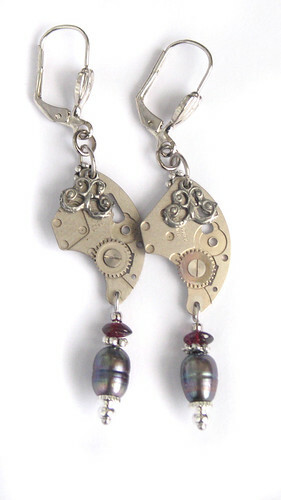 i was going to post a photo of the steampunk jewelry.. and forgot. a brooch - the pendulum part swings. :D the "claw" moves a bit too. So dear friends, I know I've been absent for almost a half month now - my home laptop is pretty much out of commission. It served well but has been acting up lately. I've spent a while backing everything up. I've been up to other things though - writing certainly - but lately I've been on a creative kick of epic proportions (well epic for me). I started to create jewelry again. I'm not sure how many of you know I used to own a Bead store - a very small one - when I lived in Montreal in the 90's. It was more like a cart/store - in le Faubourg in Montreal. Anyway it was fun - a lot of work - but I loved it. When I left Montreal though I had several boxes (deep big Rubbermaid containers that weighed a godload) of beads, finding and materials. Masks. I was a mask maker for a while - fancy feathered beaded masks. All kinds of stuff. When I got back to Toronto I made more jewelry until the late 90s when my carpel tunnel got so bad I had to quit. My hands would go numb every night. Needless to say in the last 8 years the only real jewelry I've made has been personal stuff. some necklaces. Sometimes a gift for a friend. made some post a while back about jewelry. Suddenly my brain exploded. 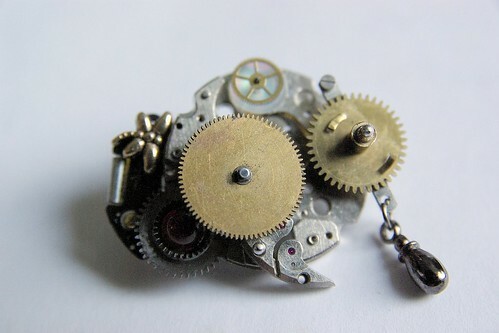 I saw steampunk jewelry... and it set something ticking in my heart. Tick-tock ticktock... this. this was the kind of jewelry I love.. and I could make. Yup. There was nothing to do but pull out The Boxes from the Closet of Doom - and start digging. I found watch parts, beads, watches (seems like i break the things all the time and still get them as gifts - cheap watches though, no fear). That was Friday Jan 25th when i pulled out the Boxes. By the next week I was already starting to make jewelry. So my friends... I'm going to let you all in on a secret - I started a jewelry blog. I want to keep it separate from my current LJ friends though because I don't want to bother y'all with my rattling on about jewelry. But, if you like - do go check it out. I might make the occasional post here about jewelry.. but that LJ details most of what I'm doing and creating. where i'll be posting my jewelry and stuff. Please feel free to not-friend or friend as you wish. I still won't be making a ton of postings anywhere. I will though be selling the bijoux - so here's a question... has anyone sold stuff on ebay? I'm thinking of doing so but really have no idea where to start. and is anyone else watching "The Sarah Conner Chronicles"? The Big Bad is now a Permanent Resident! No more immigration hassles! He's here to stay! He'll be able to get medical, get onto my work insurance, travel all he wants. It is a fantastic thing. I'm so damned happy. I was almost sick with anxiety the night before yesterday. All Monday I was fretting, and that night I think I only slept 2 hours. I'll try and post again later this week and catch up with everyone. I think she'll appreciate this. Anyway, all the best for you, Rain. 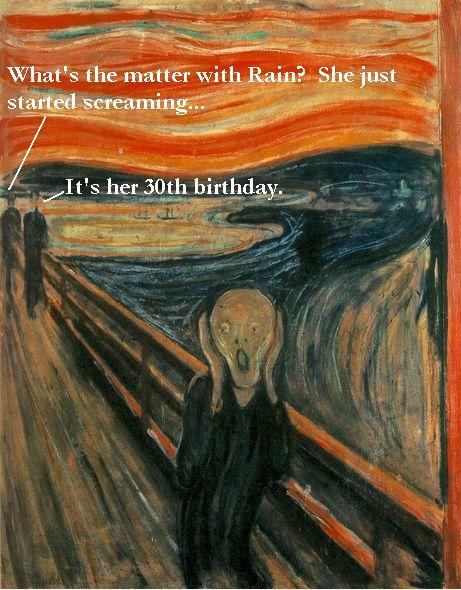 May the 30's be good to you! 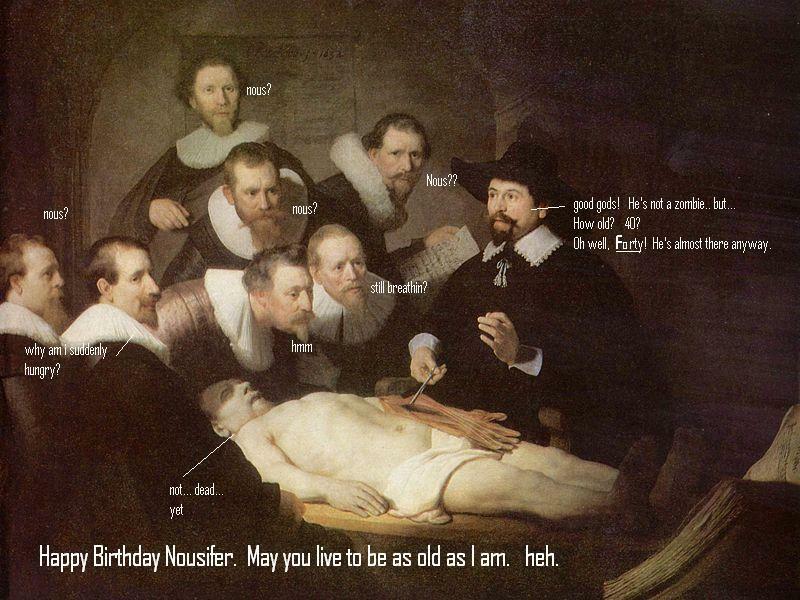 Heh, thought i was so old I wouldn't remember Nous? Welcome to your forties. Hope you have a great day!